We love Empress Aesthetics at Gold Dust Dental because it ensures gorgeous custom restorations. Our dentists appreciate the predictable results in everything from dental implants, conservative inlay/onlays, and crown and bridgework to smile designs and complex reconstructions. Truly, the right materials can take a patient’s smile from fair to fabulous. Read on to see case results and a stunning veneers smile transformation that benefited from Ivoclar’s time-tested material. Dr. Kern’s patient was very self conscious of her “little teeth” and dreamed of having a whiter, brighter, and fuller smile. After attending a CE course, Dr. Kern knew the patient was a perfect candidate for minimal prep Empress Aesthetics. Confident with the past performance of Empress products and Gold Dust’s expertise, the impressions and photos were taken for 10 veneers. Rob Maata selected the ingot to achieve the desired shade of 020. 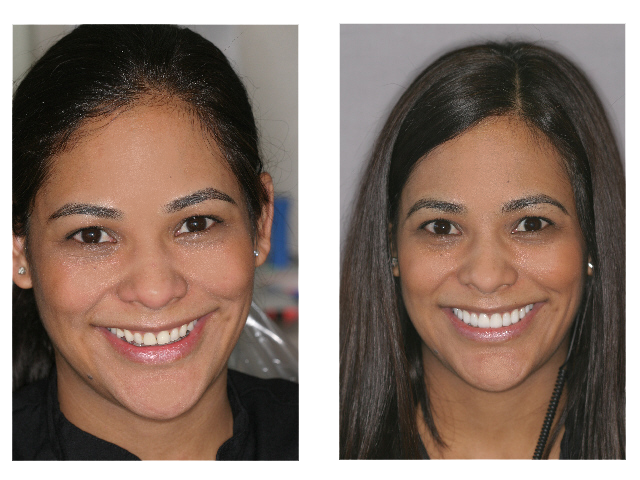 In just two appointments, the patient’s smile went from fair to fabulous! What is your favorite aspect of cases involving veneers? We’d love to hear from you in the comments!